I hear a thundering, heavy sound, I look out the window … and another rain storm has begun. I am in the week between closing one play and beginning rehearsals for another and have the desire to curl up in a chair in my pajamas, learn my lines and stay out of the rain, which has been pounding down for the past week. 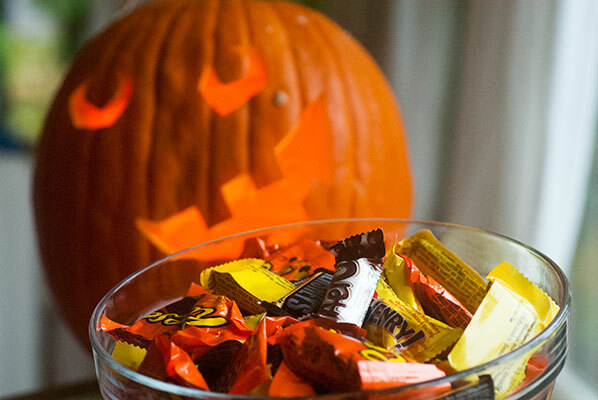 And in the middle of it all was Hallowe’en. I usually love Hallowe’en . It is one of my favorite events of the year, as unlike Christmas or New Year, there are no expectations of how to “do it right”, there are no huge expectations of extended family getting along … it’s all about fun. The procuring of costumes (which change with the moment, in our house), the gooey, tactile joy of scooping out pumpkin guts and squirting the seeds between my fingers at the boys, the tiny witches and Pooh Bears who can be heard giggling and scuffling outside the door before the bell rings and the “Trick or Treat” is shouted. I didn’t see very many of them this year, as the driving, bullet-hard rain kept most of them indoors – one brave wee soul ventured out with his lovely drenched parents – and a few bedraggled ‘tweens, but at the end of the evening I was left with far too much cheap chocolate for my comfort – very dangerous to have around when supposedly learning lines. If all of this seems rambling and long-winded, it is. But it is not entirely random, because it is, in fact, an introduction to one of my favorite confections, and one I had a great desire to make this week, as an antidote to the overly sweet and unsatisfying peanut butter cup, consumed while on Trick or Treat door duty. 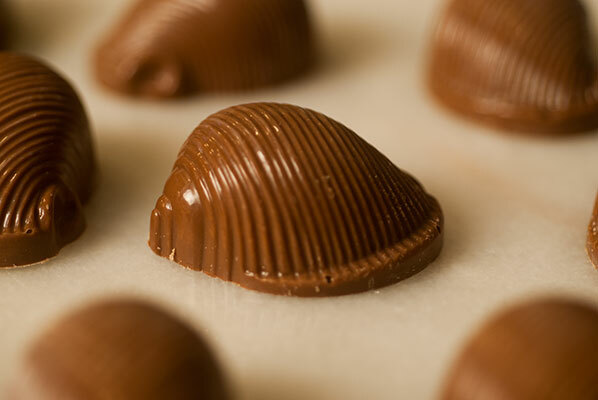 It is that gorgeous hazelnut and chocolate combination, popularized in hedgehog chocolates: Gianduja. 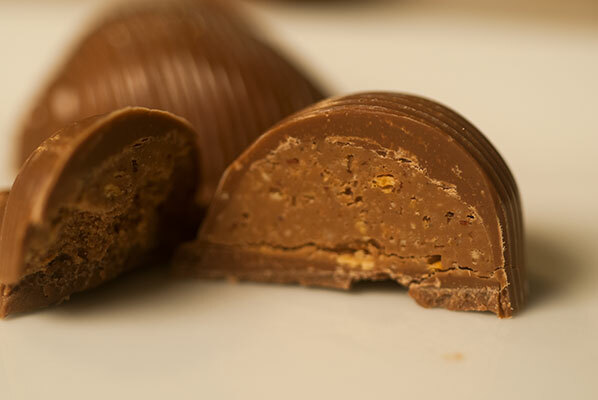 Gianduja takes its name from Gianduja, a Commedia dell’Arte character represented by a mask of an honest peasant of the Piedmontese region in Italy, where this hazelnut confectionery is common. We never wore masks at Hallowe’en, as my Mum considered them unsafe, and didn’t like the fact that you couldn’t see the person’s face, but I absolutely loved learning mask work in theatre school, and think it only fitting that one of my favorite chocolates is named after such a well-loved character. Apparently, the idea of mixing hazelnut pieces to “standard” chocolates was born during Napoleon’s reign, when importing cocoa from South America became extremely difficult. “Raw” cocoa was extremely expensive, so local producers started incorporating bits of roasted hazelnuts (hazelnuts are locally grown and were easy to come by in Piedmont) to make the final product more affordable. The taste of hazelnut is, I think, so rich and sweet that it needs nothing else to gild it, and although I am a devotee of dark chocolate, I am going to make my gianduja today with the traditional milk chocolate, as Pam notes on the Ecole Chocolat lesson primer, that milk chocolate allows the flavour of the nut to come through. 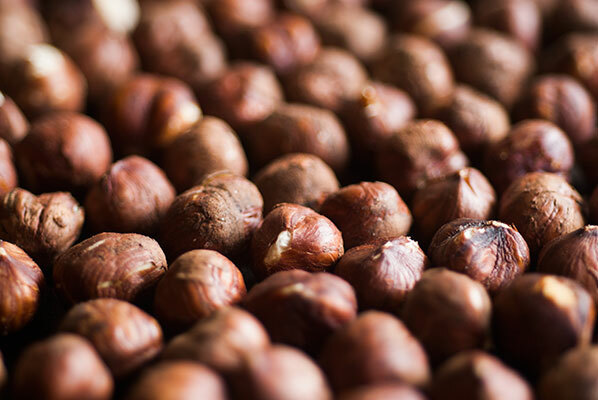 Compared with other nuts, hazelnuts are among the lowest in saturated fat and among the highest in heart-healthy monounsaturated fatty acids. 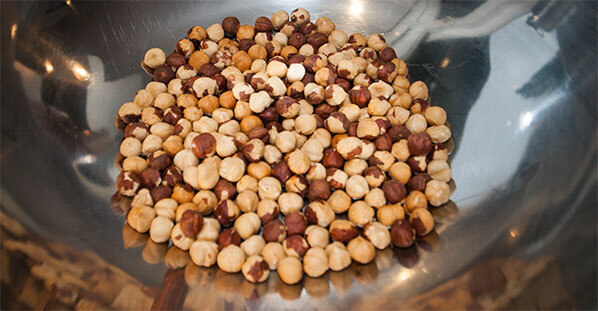 Hazelnuts are an excellent source of vitamin E. They’re a good way to boost the protein content of a product without significantly raising carbohydrates, and they provide folate and add a variety of important antioxidants. The one previous time I made gianduja, I tried doing a dark chocolate and walnut combination, which sounded good, but ended up tasting far too bitter, so milk chocolate it will be for my hazelnuts. I am using a very good, caramelly milk chocolate couverture: Callebaut Smooth, with 32% cocoa solids – a great favourite of my family’s – I have to hide it in a closet. Because it is a mixture of only two ingredients: the nuts and the chocolate, really good ingredients are vital. 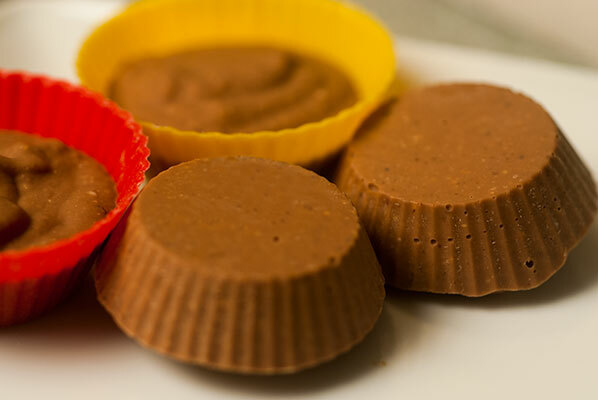 It is almost impossible to make a gianduja at home which has exactly the consistency of the commercially produced gianduja available from chocolate manufacturers. As Pam says “the industrial equipment produces a very fine grind that emulsifies the chocolate and nuts, resulting in a smooth, melt-in-your-mouth texture”. I may not have the big machines required for this, but I do have an ancient, reliable food processor, and the resulting gianduja produced from the following Ecole Chocolat master recipe is I think, absolutely delicious. It all came together easily, and I left it to sit for a few moments, while tempering a pound of milk chocolate and using it to hollow fill the cavities of two sets of poly-carbonate molds. I painted the cavities of the molds with a very thin coating of tempered cocoa butter, before pouring in the tempered chocolate, as I hadn’t used one set of them in a while, and was a bit unsure of how well the finished bon bons would release. Once the shells had set, I scooped the gianduja into the centres and after a few minutes, put on the backing coat of chocolate. Pam gives a couple of other options, both of which have you temper the gianduja just as you would for chocolate, then: either pour it out onto parchment as though a ganache (which can later be cut into desired shapes), or it can be scooped with two spoons into the classic “upside down boat” shape, and left to harden. The bon bons released beautifully from the molds, a couple of hours later, and the small amount of cocoa butter painted into the cavities, definitely seems to have improved their gloss. 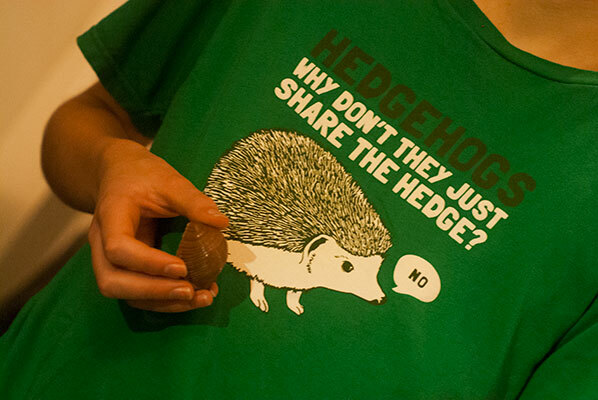 They look almost exactly like the “Hedgehog” chocolates I used to love, from one of my favorite local chocolatiers, growing up – I have never understood why this hazelnut/chocolate mixture is often called hedgehog. But they taste absolutely heavenly. Silky smooth and mild mannered (maybe that’s why), just one is the perfect size to satisfy. But I have very good chocolate.